I seem to be pretty much on the mend now. I’m no longer spending my days in bed feeling sorry for myself. Instead I’m just left with a bit of cough and nasty headaches. Fingers crossed they will soon be gone! Here is a quick outfit that I wore yesterday, featuring my new House Of Holland suspender tights. These are the ones with the houses and chimneys making the ‘suspender’. I love them so much but have already laddered them on the first wear. Luckily its not too noticeable so I should be able to get another couple of wears out of them. Not great for a £12 pair of tights! I’m also wearing my new Chanel Rouge Coco Lipstick in number 31, Cambon. It was a Christmas present from my parents and I love the colour so much. The whole look is a little different to what I usually wear, but I think it works. Hope you like it! 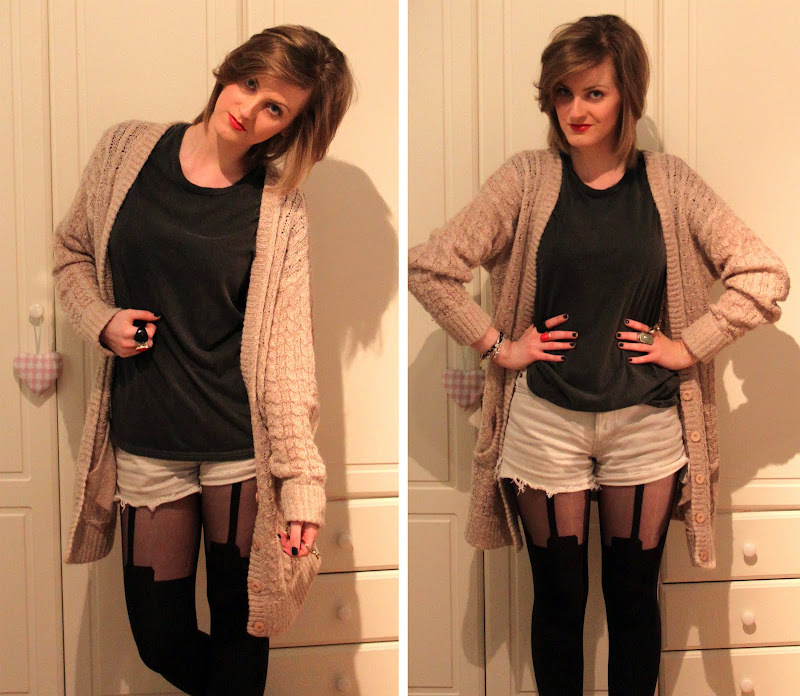 Love your cardi and tights, I did exactly the same with a £10 Topshop pair after just 1 wear, so painful! I tried on that Miss Selfridge ring on instore too and got it stuck on my finger, took me so long to get off that I thought it probably wasn't meant to be and popped it back on the rail! Ah gutted about the tights – they look fab too! Just out of interest, how much were your cut offs? I've been looking for some for aages now, and can't find any at a decent price – will try COW in brum if it's any cheaper! Hello 🙂 They were a fiver!! I had to really root to find them though, all the blue denim ones were a little more, like anywhere between £7 and £15, so still fairly cheap! Love the way you're wearing the tights, and you're looking a damn site better than I do post sickness. Hope you shake it off soon. Love this outfit. I've been lucky with my HOH suspender tights so far but i've been too scared to wear them. I put a tiny ladder in the bandana over the knee ones though on my first wear, gutted! Hope you get fully better before uni starts!!! Love that sweater! What a scandalous outfit. Yet comfy and stylin. So fly. My HH tights laddered the first time I put them on 🙁 SO gutted!